Soul Seeker is for Sale. 12 year old OTTB Bay gelding. Exceptional 3' Hunter. "Sully" is currently enjoying a successful career in the 3"6 Junior Hunters. Pins well over fences and under saddle. Qualified for RAWF in 2017 and 2018 and was just short of qualifying in the 3' Children's Hunter Division in 2015. 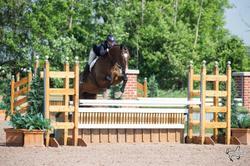 Sully would excel in the 3' Children's or Adult divisions with an experienced, solid rider. His lovely step and quality jump make him a fit in the hunter ring, however, he has done dressage and would find a competitive life in that ring as well. Together with the Junior division, Sully competes regularly in the 3' Thoroughbred Classics. He steps out of the ring in the top ribbons every time. Sully loads, ships quietly, clips, and cross ties well. Sully's devoted owner is bound for higher education, and wants to find another devoted owner who will round out Sully's career. Price is listed in CND. SOLD THANKS GREAT WEB SITE!! !